So as I am pinteresting from my heated bed, I came across this amazingly decorated home here. This is what I call getting your holiday on. 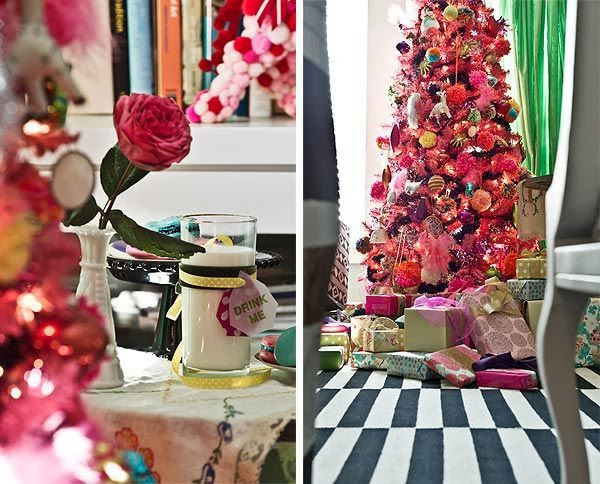 If I ever muster up the energy to put a tree up again, it will be hot pink. That is a promise. Just try and tell me you don't love this set up. Happy weekend my darlings. Fell in love with this wonderfully creative home when it was featured on Houzz. It feels only natural that they've gone pink for Christmas. It's perfect! Wow, it's absolutely gorgeous! I love all of the bright pops of color throughout the holiday decor!! Lovely space! love this! adore the bright colors! heaven! love all those bright colors! so bold! I want it. I want it all. Right now. All of these photos are breath taking, I love it all!